The urban plaza in front of the golden Library and Cultural house in Copenhagen’s Northwest Quarter wins Danish Landscape Architecture Award 2017. The project design team includes Schønherr, COBE and TRANSFORM, with Grontmij as engineer, Malmos A/S as Developer with the municipality of Copenhagen as client. 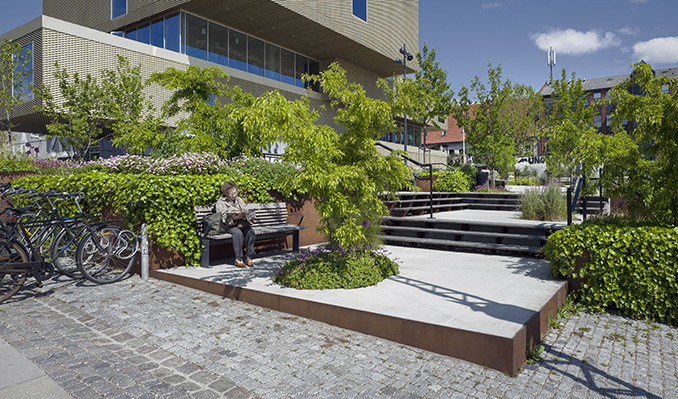 The urban plaza in front of the golden Library and Cultural house in Copenhagen’s Northwest Quarter wins Danish Landscape Architecture Award 2017. 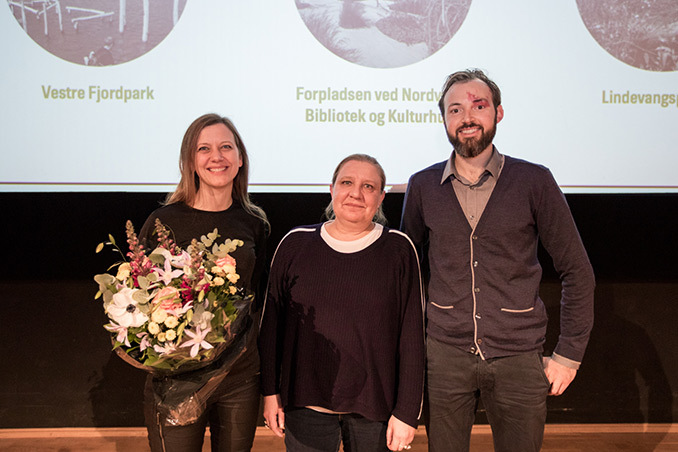 Minister of Culture Mette Bock (LA) handed over the award to the reputable landscape architects of Schønherr, whom accepted the award on behalf of the entire team along with a COBE representative. 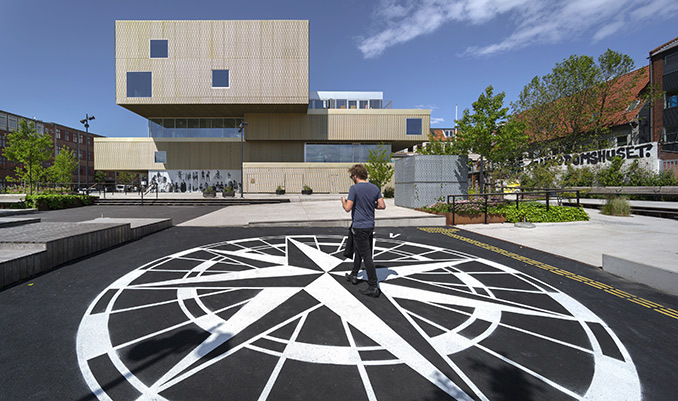 On stage at the National Museum of Denmark, the two remaining finalists, Vestre Fjordpark and Lindevangen, received honorable mentions. The 2000 m2 of urban space made up by the urban plaza in front of the golden Library and Cultural house in Copenhagen’s Northwest, is conducted by Schønherr, COBE and TRANSFORM, with Grontmij as engineer, Malmos A/S as developer and the municipality of Copenhagen as client. Danish Landscape Architecture Award is presented in cooperation between Park- og Naturforvalterne, Danish Association of Architectural Firms and Danish Landscape Architects, consisting of 70000 kroner in prizemoney. The jury consists of representatives from the aforementioned organizations in addition to two impartial judges. 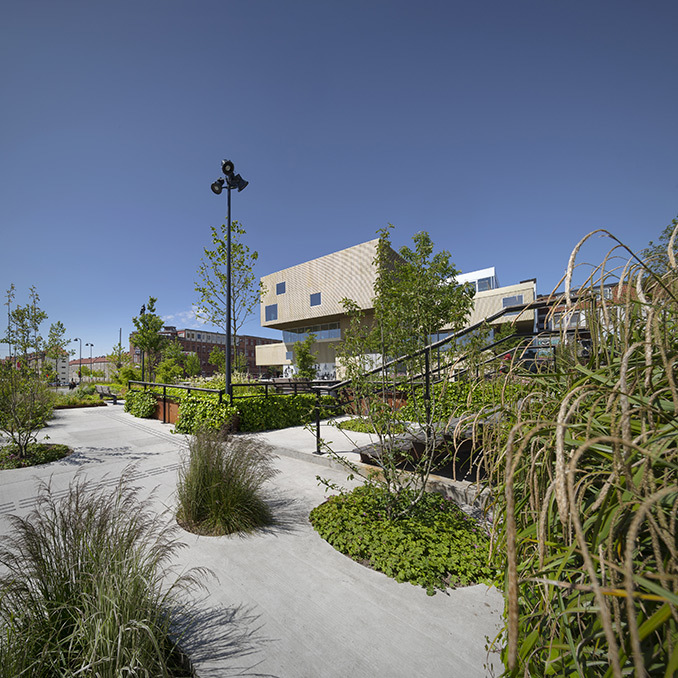 Marking the 8th award ceremony since 2009, Bo Holm-Nielsen sees the growing recognition of landscape architecture increasingly adding value to the sectors of building and construction. Following the ceremony, the stage transformed to a debate room with members of the jury discussing “New life for public city- and landscape-environments”. On stage were Ellen Braae, professor and landscape architect, University of Copenhagen, Helle Juul, architect and associate of JUUL | FROST Architects and Jon Stephensen, manager of the theatre Avenue-T and architect. Master of ceremonies throughout the show was Ane Cortzen, culture manager at Kähler, architect and graphic designer.